"I am utterly confident you will enjoy this edition and find innumerable pearls of diagnostic wisdom that will bolster your practice of intraoperative consultations." 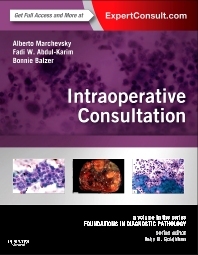 Take an integrated approach to intraoperative consultation with chapters that have been coauthored by both pathologists and surgeons. Grasp today's most up-to-date information for the pathologist and surgical team with a templated format that includes techniques of specimen collection, differential diagnosis, additional ancillary studies, terminology, and proper reporting. Effectively perform frozen sections with help from high-quality color illustrations, photomicrographs, and gross photography. Expert Consult eBook version included with purchase.